TYEF joins forces with GLAD GLBTQ Legal Advocates & Defenders to bring awareness of your constitutional right to protest peacefully. 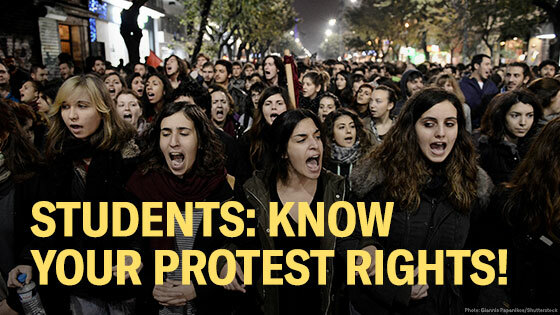 We are providing these links to help you plan, remain safe, and know your rights when engaging in the act of protest. *We recommend strongly that you discuss this with your parents and inform them of your whereabouts when protesting. Because participating in any street demonstration always involves some risk of arrest and because transgender individuals are especially vulnerable in these situations, some may wish to support a direct action in other ways. An example of this could be to help by arranging food deliveries for protesters or helping to raise bail money. Youth can also create signs, graphics, videos, or other media that share a personal story, a message or otherwise support the cause or action. Don't hit the streets until you have reviewed this!